Eurasian collared dove Streptopelia decaocto, the most widespread Streptopelia species in Europe. Photo by Rovdyr. The bird genus Streptopelia comprises the turtledoves or collared doves - thirteen to seventeen species (depending on preferred generic boundaries) of medium-sized, generally pinkish birds that have long garnered human admiration due to their attractive appearance and cooing vocalisations. The name "turtledove" is derived from the Latin turtur, which is itself an imitation of the sound made by the doves. The calls of different species of turtledoves are distinct, and often play a significant part in their identification (Slabbekoorn et al., 1999). Streptopelia doves are native to Africa and the warmer parts of Asia and Europe, but a number of species have been introduced to other parts of the world. Here in Perth, for instance, the laughing dove S. senegalensis and the spotted dove S. chinensis are both abundant (the former particularly so), while S. chinensis is also a successful exotic in Auckland back in New Zealand. Also widely introduced is the African collared dove or Barbary dove Streptopelia risoria*. *The Barbary dove ("S. risoria") is the domesticated form of the African collared dove ("S. roseogrisea"), and most modern authors no longer regard the two as specifically distinct. S. risoria Linnaeus, 1758 has priority over S. roseogrisea Sundevall, 1857. However, it has become common practice for the name based on a "wild" taxon to be given preference over one based on a domestic taxon because of the often complicated nature of taxonomic concepts in relation to domesticated animals (Gentry et al., 2004), and so many authors have preferred to use S. roseogrisea for the combined taxon. A recent proposal to formalise this situation was turned down by the ICZN (ICZN, 2008), leaving S. risoria as the valid name for this species. The Madagascar turtle dove Streptopelia picturata (aka Nesoenas picturata). 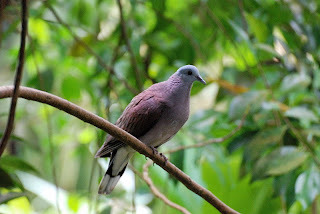 Phylogenetic analysis indicates that this species is closely related to the pink pigeon Nesoenas mayeri (=Streptopelia mayeri) of Mauritius. Though distinct morphologically, the two species have very similar vocalisations. Photo from here. 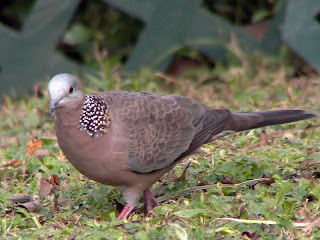 In the past, Columbidae (pigeons and doves) have mostly been divided between two subfamilies, the Columbinae (standard columbids) and Treroninae (fruit-pigeons and fruit-doves), with separate monogeneric subfamilies for the morphologically distinctive genera Goura and Didunculus (and sometimes Otidiphaps) and a separate family Raphidae for the extinct dodo Raphus cucullatus and solitaire Pezophaps solitaria. This arrangement, never particularly sturdy at the best of times, has been blown out of the water by recent analyses (Pereira et al., 2007), which render the traditional Columbinae paraphyletic to the other subfamilies and Raphidae while the Treroninae becomes polyphyletic. To date, no-one has formally proposed a revised subfamilial classification of Columbidae, though Pereira et al. (2007) did recognise three well-supported clades in the family which they called simply A, B and C*. *Because I have the comfort of knowing that no-one is going to take any notice of me in this matter, I can reveal that if we were to recognise these three clades as a subfamily each, they would become respectively Columbinae, Claravinae and Raphinae (going by the dates reported in Bock, 1994), and I find a certain pleasant irony in the idea that Raphinae would be the largest of the three. The collared dove Streptopelia chinensis (=Stigmatopelia chinensis). Originally native to eastern Asia, the collared dove has been widely introduced elsewhere in the world. Photo by Charles Lam. Whatever the eventual division of the family, Streptopelia will almost certainly remain a part of Columbinae, as it is the most closely related genus to Columba. Molecular analysis of fourteen of the sixteen species generally included in Streptopelia by Johnson et al. (2001) identified three main clades in the genus - a large clade containing the majority of species, a clade uniting S. chinensis and S. senegalensis, and a clade containing the Madagascan S. picturata and the pink dove Nesoenas mayeri of Mauritius. This three-part division is also reasonably consistent with morphological and vocal distinctions within the genus. The two smaller clades were in turn sister to each other, but the monophyly of Streptopelia as a whole was not proven; depending on the chosen method of analysis, either Streptopelia was monophyletic (the maximum likelihood results) or the main Streptopelia clade was sister to a clade containing Old World Columba and the two smaller clades (the maximum parsimony results). New World 'Columba' species were the sister clade to Streptopelia plus Old World Columba whatever the method; their recognition as a separate genus Patagioenas was proposed. Johnson et al. (2001) chose to retain Streptopelia in its previous circumscription, but with 'Nesoenas' mayeri also included. In contrast, Cheke (2005) suggested restricting Streptopelia to the main clade and recognising the smaller clades as separate genera Nesoenas (for mayeri and picturata) and Stigmatopelia (for chinensis and senegalensis). Johnson et al. 's (2001) system has the advantage of minimising the number of name changes involved; Cheke's (2005) system is potentially more robust to the uncertain monophyly of the broader Streptopelia; only time will tell which gains the greater popularity. Cheke, A. S. 2005. Naming segregates from the Columba–Streptopelia pigeons following DNA studies on phylogeny. Bulletin of the British Ornithologists' Club 125 (4): 293-295. Gentry, A., J. Clutton-Brock & C. P. Groves. 2004. The naming of wild animal species and their domestic derivatives. Journal of Archaeological Science 31: 645-651. ICZN. 2008. 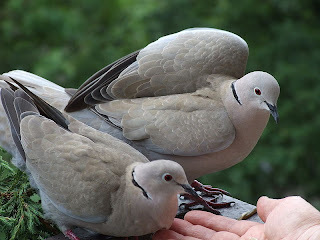 Opinion 2215: Streptopelia risoria (Linnaeus, 1758) (Aves, Columbidae): priority maintained. Bulletin of Zoological Nomenclature 65 (4). Johnson, K. P., S. de Kort, K. Dinwoodey, A. C. Mateman, C. ten Cate, C. M. Lessells & D. H. Clayton. 2001. A molecular phylogeny of the dove genera Streptopelia and Columba. Auk 118 (4): 874-887. Pereira, S. L., K. P. Johnson, D. H. Clayton & A. J. Baker. 2007. Mitochondrial and nuclear DNA sequences support a Cretaceous origin of Columbiformes and a dispersal-driven radiation in the Paleogene. Systematic Biology 56 (4): 656-672. Slabbekoorn, H., S. de Kort & C. ten Cate. 1999. Comparative analysis of perch-coo vocalizations in Streptopelia doves. Auk 116 (3): 737-748. So would Raphinae include most of the fruit doves? Incidentally, is Calloenas still placed as the closest to the dodo - I know the estimated divergence date was quite early, and Goura was also placed close to the dodo and solitaire. Yep, Raphinae would include all the old "Treroninae", plus a few "columbine" genera. That is, assuming that a formal reclassification would recognise each of the Pereira et al. clades as a single subfamily (which, of course, there's no need to necessarily assume that they would - they may divide Pereira et al. 's clade C into a number of subfamilies instead).It is also possible, of course, that someone may end up putting in a request to conserve Treroninae over Raphidae (and there's a few further complications that I didn't mention because I can't tell how they'd turn out). Pereira et al. continued to support the same position for the dodo and solitaire as had been found by Shapiro et al. (2002), but that's not necessarily indicative of much because they were using the same data. As it happens, that wouldn't be the only case of a biogeographical connection between the Mascarenes and southern Asia.